Svalbard-I is a hydronic cooling, heating and ventilation system for use in offices, shops, schools etc.The system is designed to provide a draft-free cooling effect in the occupied zone. Svalbard-I is suitable for integration in a ceiling grid with 600mm modules. Svalbard-I is delivered with integrated pressure outlet for air flow rate measurements. 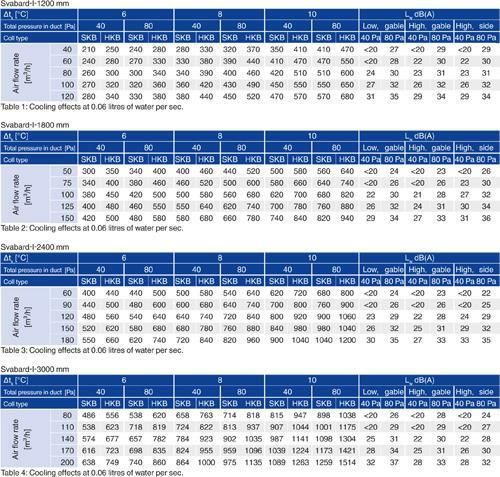 Dispersion options: symmetrical 50/50 or asymmetrical 75/25 (25/75) – can be adjusted on site. Connection to air: Svalbard-I, 175mm height, is equipped with a Ø125 spiro connection at gable end (spigot dimension). Fig. 1 and 2. Svalbard-I, 235mm height, is available with Ø125 side spigot. For alternative positioning options, see fig. 1 & 3 and under order code. Connection to water: copper pipe, Ø15x1.0 mm. Delivered with vertical pipe-ends as standard (see fig. 1, 2 & 3 and under order code). Frame and casting in a galvanised, steel-plated finish. Delivered in white painted finish (RAL 9003 - glans 30) as standart. Copper tube coils with aluminium lamallae. Adjustable lamallae are in plastic design. Svalbard-I is supplied with four mounting brackets that is attached to the baffleshort ends, by hooking brackets into the rectangular slits in the gables. See Figure 8. You have possibility of adjustment +/- 10 mm in the baffle width direction, and vertically by means of. threaded rod. Use of anchor or similar is recommended when mounting on a concrete base. 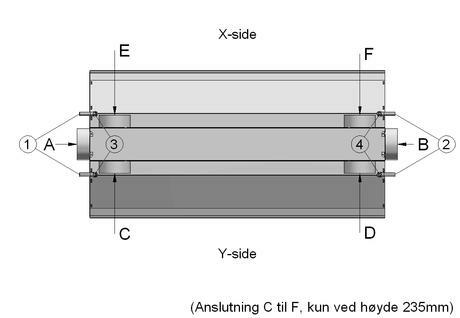 For horizontal connection to water (copper pipe Ø15/1), use press, push or screw fittings. I.e. 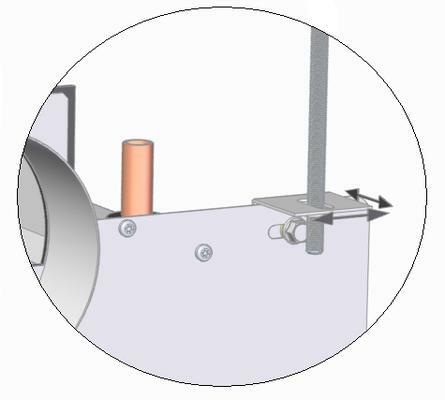 do not use soldering or similar techniques as the heat may damage the O-ring on the push-fit coupling between the cooling coil and pipe bend (see fig. 10). Air is supplied via nozzles, and indoor air is extracted and fed through the coil. Effective mixing of indoor air and supply air, i.e. induction, minimises the risk of draft in the occupied zone. When Svalbard-I is used for heating, the same technique is used for dispersion of heat along the ceiling. The indoor air is extracted through the perforated area on the unit’s front panel in order to avoid dirt accumulation on the ceiling.